Here are two for this month of April 2015. I really like doing the “made fabric”. I hope I can find the time to finish more before the month is out. 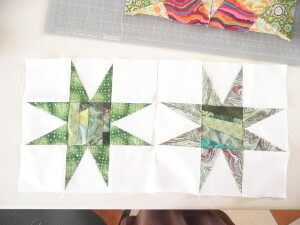 I’ve got made fabric for the centers of 5 blocks but the trick will be finding the spare time to sew them. We are having a really good tourist season here in Cancun and I’ve got to make hay while the sun shines!! !